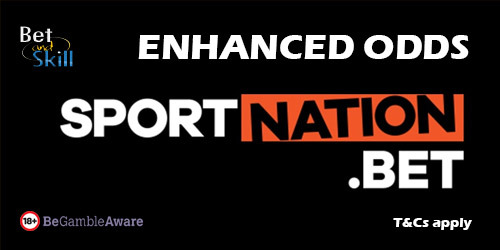 Claim 50/1 Spurs to beat West Ham at SportNation! Best price! This matchweek's Premier League opening match see Tottenham visit West Ham on lunch-time. Wanna bet on this London Derby? 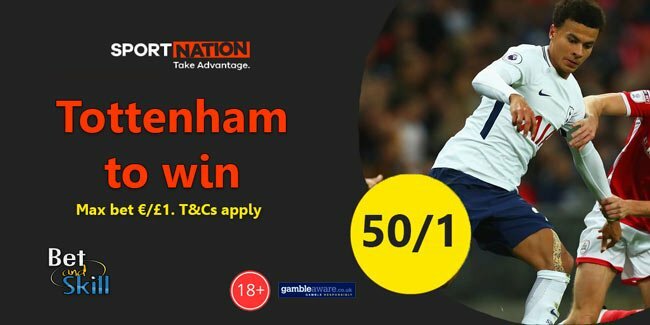 SportNation are offering the best price on Spurs to win! Find here how to claim 50/1 Tottenham to beat West Ham! Tottenham have won both of their away matches in the league so far this term. A win would equal a club record of five successive Premier League away wins. Just follow few simple steps below.. Simply register and deposit through the promotional page. Then proceed to place your bet on 'Tottenham to win vs West Ham' in the 'Match Winner' betting market at standard odds. 2. Make your first deposit and place a bet on Spurs to beat West Ham in the premier league at normal odds. 3. If the bet wins you will be credited £50 in bonus funds with turnover requirements of minimum odds of 2.00 and £450 turnover before bonus cash will become withdrawal. System bets will not count towards the wagering requirement. 6. Offer expires at kicks off. "Claim 50/1 Spurs to beat West Ham at SportNation! Best price!"